Friday, June 17, marks the one-year anniversary of the racially-motivated shooting of nine worshipers at Emanuel AME Church in Charleston, South Carolina. There have been 551 mass shootings of four people or more since then. But the shooting last Sunday, June 12, is now considered the worst mass shooting in U.S. history with 102 people–mostly young gay Latinos— shot by a deranged terrorist with an assault rifle at Pulse nightclub in Orlando, Florida, leaving 49 dead, 53 wounded and families and a country devastated. Though gun violence has always been an LGBT hate crime issue, the Orlando massacre brought it to the foreground. The National Coalition of Anti-Violence Programs released a study this week noting that reported LGBT homicides rose by 20 percent in the U.S. between 2014 and 2015. Of the homicides reported last year, 62 percent were LGBT people of color. The epidemic of carnage has prompted LGBT groups such as Equality California to say enough is enough and to make gun control legislation a new top priority. 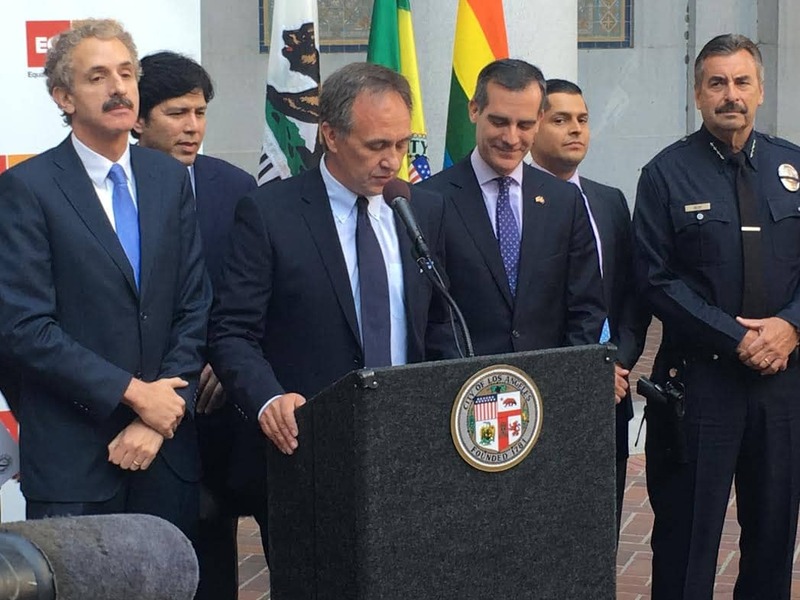 “Last weekend, the LGBT community was the target of the worst mass shooting in U.S. history,” said Rick Zbur, executive director of Equality California at a Friday news conference at Los Angeles City Hall with state legislators, LAPD Chief Charlie Beck and LGBT activists. “Orlando is a call to action. Ending gun violence must be one of the LGBT community’s highest priorities. We must take every step to strengthen gun safety laws at the federal and state level to prevent another Orlando from ever happening again. This is not some esoteric rhetoric—Equality California has a personal stake in stemming gun violence. “Orlando impacted us personally,” says Zbur with straight ally and board member Mark Vargas flying to be by the side of his beloved Latina cousin Laura, one of the first to be shot in the Pulse nightclub. She was there celebrating a personal success with one of her best friends. Not until she came out of critical condition in the hospital did Vargas tell Laura that her friend was among the 40 horrifically murdered. He died next to her. “It’s just a heart breaking story,” says Zbur. It’s a heartbreak President Obama has shared too many times. After visiting with the families of the murdered victims in Orlando on Thursday, he noted that there has been a stalemate in Congress that allowed the Orlando shooter to buy an assault weapon without undergoing a background check. In a separate email sent from the White House, Vice President Joe Biden referred to two amendments to the defense appropriation bill that Senate will bring up for a vote on Monday. The legislation, opposed by the powerful National Rifle Association, calls for universal background checks and a ban on suspected terrorists on the FBI’s no fly list from buying guns without restrictions. That is a message heeded by EQCA in launching its #SafeAndEqual campaign to end gun violence by advocating for tougher common sense gun control laws at the federal and state levels, as well as making positions on gun control a major criterion when considering endorsing and supporting a candidate, as well as targeting a candidate for defeat. “This is a national problem and California again needs to lead the way,” said LAPD Chief Charlie Beck. At the state level, Equality California will aggressively lobby the legislature and Gov. Jerry Brown for a package of gun safety reform legislation deemed imperative by state leadership. Equality California is still evaluating Safety for All, a ballot initiative backed by Lt. Gov. Gavin Newsom. Additionally, Equality California joined Obama and Biden in calling upon Congress to immediately adopt comprehensive federal gun safety legislation aimed at prohibiting military style assault weapons and large capacity magazines, closing gun show loopholes on background checks, and strengthening background checks and waiting periods to keep guns out of dangerous hands. More response is needed, as evidenced by the news that two Marines stationed at Camp Pendleton are under investigation for posting an apparent threat against gay bars on social media after the Orlando shootings. “The photo initially surfaced on the Facebook page for “Camp MENdleton resale” and showed a Marine pointing a rifle at the camera with his finger on the trigger and a caption which read, ‘Coming to a gay bar near you!’ While the image has since been taken down, the image has been reposted across various social media platforms,” KCBS2 News reports. Though “lone wolves” are still an issue, Schiff, a member of the House Intelligence Committee, says he thinks something has changed in the American psyche. SB 1235 (De León)/AB 156 (McCarty): would require licensing of ammunition vendors by the Department of Justice and background checks for purchasers. SB 880 (Hall and Glazer)/AB 1664 (Levine, Ting and Chiu)/AB 1135 (Levine and Ting): would remove a loophole in assault weapon ban that allows for “bullet buttons” to easily facilitate changing magazines. AB 1446 (Hancock): would ban possession of large-capacity magazines, limits ammunition sales to licensed vendors, and requires collection of certain information about ammunition sales, similar to procedures in place for sales of firearms themselves. SB 1407 (De León)/AB 857 (Cooper): would close loophole allowing for manufacture or possession of “ghost guns” without first obtaining a government-issued serial number. SB 894 (Jackson): would require anyone whose firearm is lost or stolen to notify local law enforcement within five days of the loss. AB 1176 (Cooper): would restore felony charges for buying or receiving a stolen firearm that were in place prior to voter approval of Proposition 47. AB 1511 (Santiago and Chiu): would limit the loan of firearms to immediate family, or to a licensed hunter whom the owner knows personally. AB 1673 (Gipson): closes loophole allowing for sale of “ghost guns,” or gun parts and components that can be easily reassembled. AB 1674 (Santiago): would limit the purchase of long guns to one per month, aligning the regulation for hand gun purchases. AB 1695 (Bonta): would stop illegal “straw” purchases, the practice of legally buying a gun and then reselling it to someone unable to legally purchase a firearm. AB 2607 (Ting): allows mental health professionals, employers or coworkers to seek retraining orders to prevent high risk individuals from obtaining firearms. Permanent funding of the Armed & Prohibited Persons System (APPS): would permanently fund additional Department of Justice officials to reduce a substantial APPS case backlog. The system maintains a database of persons prohibited from possessing firearms. Funding to establish the California Firearm Violence Research Center: would fund a center for research into firearm-related violence with the goal of developing policies and programs for addressing gun violence. Advanced by Senator Lois Wolk and passed by the Legislature on Thursday as part of the state budget, this funding now awaits the Governor’s action.